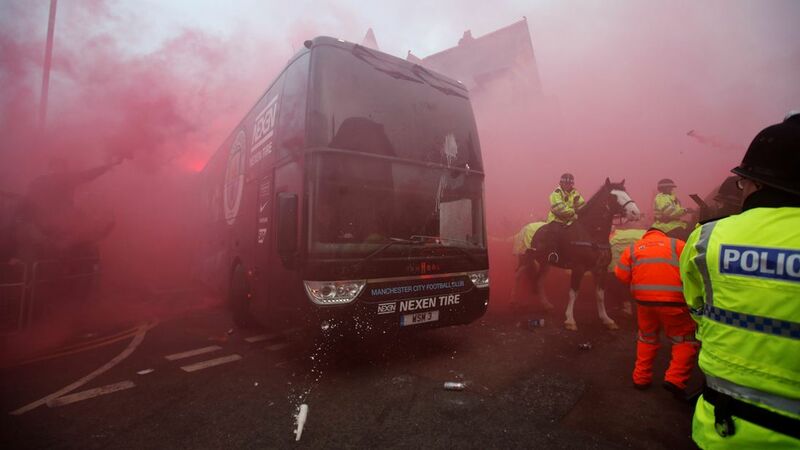 Liverpool FC has been charged by UEFA after its fans pelted Manchester City's team bus with missiles. Fans were seen throwing a number of objects - including flares, cans and at least one bottle - as City's bus made its way into Anfield for the Champions League quarter-final on Wednesday evening. Footage showed the bus engulfed in red smoke after the missiles were let off about an hour before kick-off. The vehicle was reportedly so badly damaged that City called for another for the journey home. Liverpool won the game 3-0 and will play Man City in the second leg of the tie next week. UEFA opened disciplinary proceedings at its headquarters in Switzerland on Thursday afternoon and charged Liverpool with acts of damage and crowd disturbances. European football's governing body also charged Liverpool after objects were thrown and fireworks set off inside the ground during the game. UEFA's disciplinary body will not hear the case until 31 May - after the Champions League final - meaning any sanctions would only apply next season. In a statement released just after the match, Liverpool said it condemned the "damage inflicted" on the bus "in the strongest possible terms". "We apologise unreservedly to Pep Guardiola, his players, staff and officials caught up in the incident," it added. "The behaviour of a number of individuals was completely unacceptable and the club will co-operate fully with the authorities to identify those responsible. "The priority now is to establish the facts and offer Manchester City whatever support is necessary."